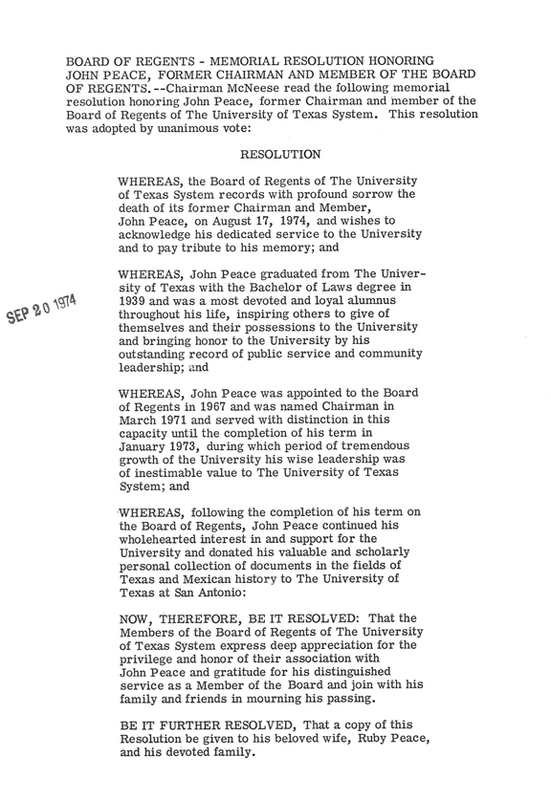 John Peace, San Antonio attorney, has served since 1967 on The University of Texas Board of Regents, under appointment of Governor John B. Connally. He was elected Chairman of the Board in March, 1971, and will complete his term as Regent in 1973. During his term as Chairman, The University of Texas System has expanded both its academic programs and physical facilities. In 1971-72, construction was begun at The University of Texas at San Antonio, The University of Texas at Dallas, The University of Texas Medical School at Houston, The University of Texas of the Permian Basin (Odessa), and The University of Texas Marine Science Institute at Port Aransas. 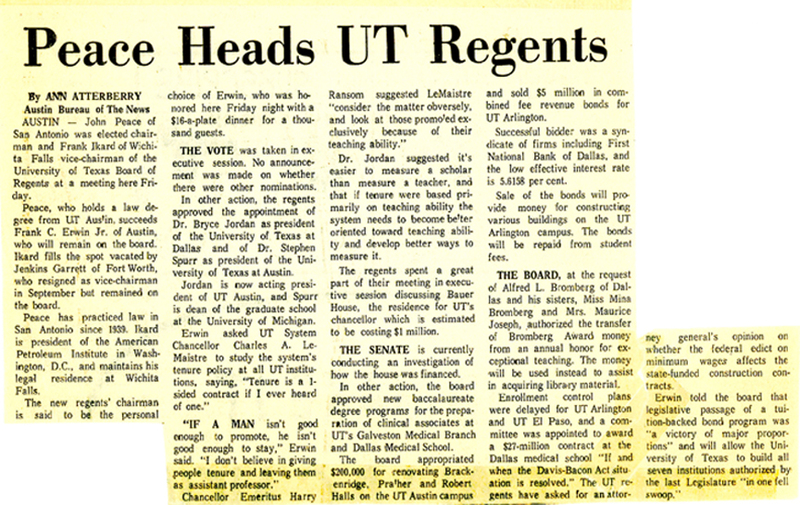 Also, a contract was let for the new University of Texas Dental School at San Antonio; and there was a general increase in the size of The University of Texas System’s nursing schools. 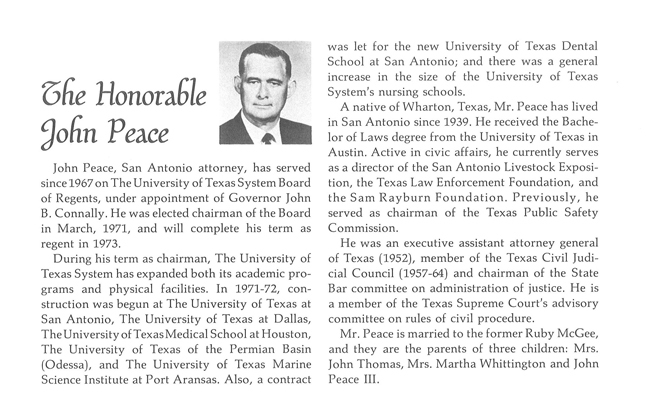 A native of Wharton, Texas, Mr. Peace has lived in San Antonio since 1939. He received the Bachelor of Laws degree from The University of Texas in Austin. Active in civic affairs, he currently serves as a director of the San Antonio Live Stock Exposition, the Texas Law Enforcement Foundation, and the Sam Rayburn Foundation. Previously, he served as chairman of the Texas Public Safety Commission. He was an Executive Assistant Attorney General of Texas (1952), member of the Texas Civil Judicial Council (1957-64), and chairman of the State Bar committee on administration of justice. He is a member of the Texas Supreme Court’s advisory committee on rules of civil procedure. Mr. Peace is married to the former Ruby McGee, and they are the parents of three children: Mrs. John Thomas, Mrs. Martha Whittington, and John Peace III.